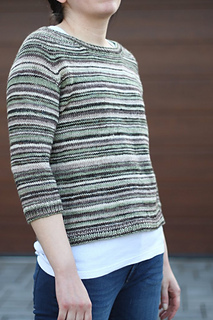 Free Spirit is a comfortable sweater knit seamlessly from the top down with random stripes. 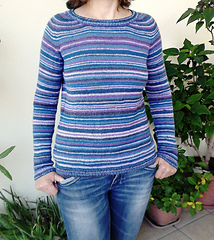 The upper yoke is worked back and forth in rows, the front neckline is shaped with regular increases simultaneously with the raglan shaping. 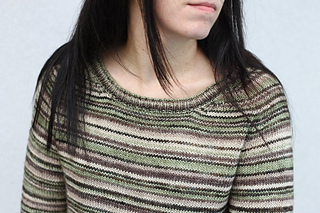 After the completion of the neckline shaping the pieces are joined together and the lower yoke is worked in the round with compound raglan shaping. 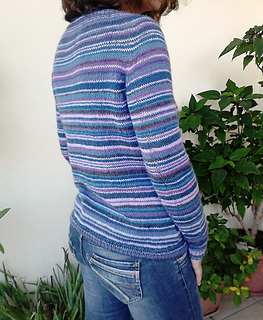 After the yoke is complete, the body is worked in one piece to the hem with gentle waist shaping. 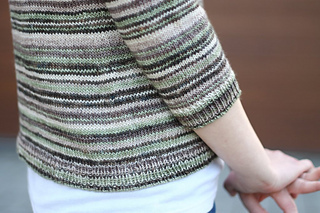 The sleeves are worked in the round to the cuff, the pattern provides instructions for two lengths of sleeves. 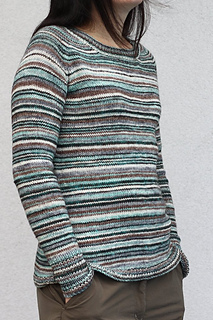 The sample pullovers are knit with 5 colourways and the stripes are worked randomly, so each colour needs to work with every other colour. The striping sequences are given row-by-row or round-by-round in table format. You can fill in the tables with the abbreviations of your colourways and keep track of the colour changes throughout. 76 (81: 86: 91: 96: 101.5: 106.5: 111.5: 116.5: 121.5) cm / 29¾ (31¾: 33¾: 35¾: 37¾: 40: 42: 44: 46: 48) inches bust circumference at underarm. Intended to fit with approx. 5 cm/2” positive ease at bust. C1: Approximately 130 (140: 145: 155: 165: 175: 185: 195: 210: 225) meters / 140 (150: 160: 170: 180: 190: 200: 215: 230: 245) yards. C2: Approximately 125 (135: 140: 150: 160: 170: 180: 190: 200: 215) meters / 135 (145: 155: 165: 175: 185: 195: 205: 220: 235) yards. C3: Approximately 135 (140: 150: 160: 170: 180: 190: 200: 215: 230) meters / 145 (155: 165: 175: 185: 195: 205: 220: 235: 250) yards. C4: Approximately 180 (185: 195: 205: 220: 235: 245: 260: 280: 300) meters / 195 (205: 215: 225: 240: 255: 270: 285: 305: 325) yards. C5: Approximately 195 (205: 220: 235: 245: 260: 280: 300: 315: 335) meters / 215 (225: 240: 255: 270: 285: 305: 325: 345: 365) yards. Long sleeves: you will need approx. 26 (28: 30: 32: 34: 35: 37: 40: 43: 45) meters / 29 (31: 33: 35: 37: 39: 41: 44: 47: 49) yards more in each colour. Longer body: for an additional 5 cm / 2” you will need approx. 14 (15: 16: 18: 19: 20: 22: 23: 24: 25) meters / 16 (17: 18: 20: 21: 22: 24: 25: 27: 28) yards more in each colour. Samples shown are size S2 with approx. 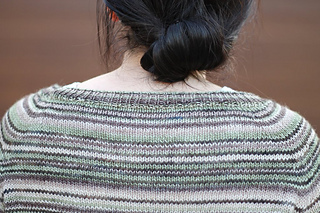 5 cm/2” positive ease at bust using MadelineTosh Tosh Merino Light (100% Merino, 384 m /420 y per skein). Sample with ¾ sleeves made in colourway Paper as C1, Antique Lace as C2, Dust Bowl as C3, Whiskey Barrel as C4 and Thyme as C5. 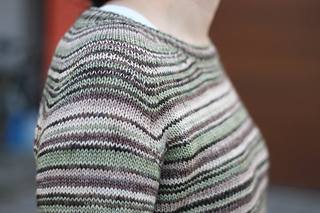 Sample with long sleeves and longer body made in colourway Astrid Grey as C1, Charcoal as C2, Dust Bowl as C3, Georgia O’Keefe as C4 and Celadon as C5. 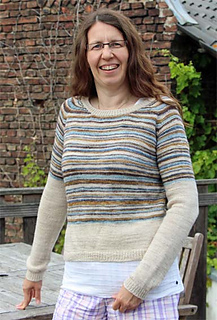 Necessary skills: Knitting in the round, knitting with dpns or magic loop, knitting stripes.